During our recent holiday trip to Cornwall we managed to visit Goonhilly and The Marconi Centre where I got to play some portable/mobile ham radio from the historic site. The video shows the Marconi Centre's antenna array and its beautiful location, as well as the massive Goonhilly Dish Arrays in and amongst some very nice QSOs on 20M, 40M and 2M. Hope you enjoy the video, More info to follow. I was fortunate to be in the shack earlier this evening in order to catch the ARISS school contact where I got the chance to try out the latest IOIo Home brew antenna that I made earlier in the week. The antenna received the ISS very well as you can see in the video that I made during the pass. The Video shows the ISS side of the ARISS school contact with Frank De Winne -OR4ISS coming through loud and clear in Yorkshire England. 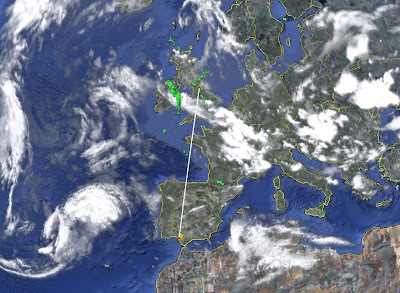 I received a 5/9+60dB signal from OR4ISS on board the International Space Station during the pass over Europe at around 19.35 utc. RX/TX - Yaesu FT-847 Earth Station. Antenna - IOIo 145/435-437 MHz Home made Satellite beam (Fixed at 30 deg Elevation), Yaesu - G-250 Rotator. At Day 4 of my 3 week holidays and some free time to spare, I spent the best part of yesterday playing radio as many ways as possible making some good QSOs throughout the day. I played on HF using phone and digi modes and I also got to test the IO-Yagi on the VHF band as well as the LEO Satellites. 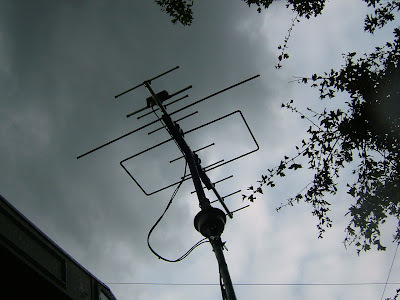 VO-52 Satellite, using the modified yagi. PSK31, running 30w from the FT-767 and Nomic Rigblaster. EA7TL. Spain, on 144.335 usb. 5/9. Sporadic E.
EA8CAC Canary Is, on 28.487 USB. 5/9. LU3MCJ - Argentina, on 14.173 USB. 5/9. HR2DMR – Honduras, on 14.180 USB 5/9. VK3MO - Australia, on 14.169 USB 5/7. There were some excellent conditions on all of the bands today as well as a burst of Sporadic - E. It was nice to hear some of the quieter bands open and being used. Well its time to jump in the bed, cuddle up to the YL and get some shut eye, I wonder what tomorrow will bring? 73. 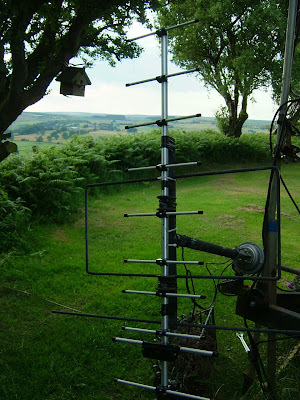 It's been just over a week since I installed the 10-element yagi in the place of the 435 MHz IO loop and as you can imagine, I have been testing it out at every opportunity. Unfortunately like the previous experiments once again I was disappointed with this time 10-elements against the single IO-Loop's performance. The new yagi appeared to be poor in comparison. So, now that I have finished for the summer holidays I decided today would be the day that I got to grips once again and sort out my home brew dual band satellite yagi/beam antenna. I had been toying with scrapping the driven element and replacing it with another IO- type loop. I dropped the antenna and set about fitting the 435 MHz loop, I used the original element/boom plastic clamps and with a bit of measuring and a few adjustments I grafted in the new loop as the now replaced driven element (DE). I then used the original (now spare) driven element as a reflector and re-positioned it behind the loop at the required gap. I now had 6 elements (D) in front and 2 elements at the back of the loop (Ref). 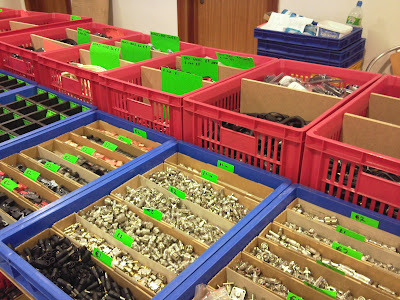 I ended up with a couple of spare elements which will be used in any future experiments that I am sure I will be trying. Once I connected the feeders I set the 435-MHz IO-Yagi to vertical polarisation fixed above the horizontally polarised IO 145-MHz beam. I decided to set the 435-MHz antenna vertically to see how it performed receiving the FM Sat's such as AO-51, SO-50 and AO-27. I will be busy testing to see the results over the next few days. I tried it out on a couple of local FM repeaters on 433 MHz and noticed that one repeater was S-5 on my Co-linear (Vertical) whilst up to S-9+30 on the IO-Yagi. The modified yagi seemed to be putting the RF in and out in the desired direction and giving a good front to back ratio. Before I can complete the evaluation, I will see how well I get up into VO-52 vertically polarised at 30 degrees elevation. 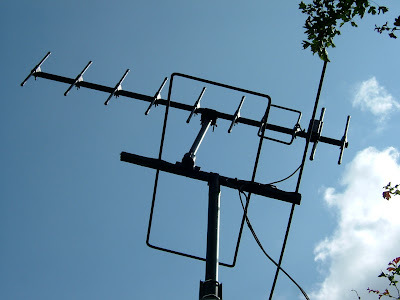 Don't be too surprised to see the IO-Yagi part of the antenna set up back to horizontal in the next post! Last night was the monthly 144 MHz UK Activity Contest which started at 19.00 utc until 21.30 utc. During the contest I made 27 QSO the furthest being 289 miles away and was G4JQN- Jerry, who is located at Westbury in Wiltshire. The band was a full of QSB and to the South East there was some QRN, despite this I still managed to enjoy myself on the band. As usual I used the homemade loop (IOIo) and 30 watts from the FT-847, a big thank you goes to all stations worked and good to get you all in the log. After the Contest I joined Adam – 2E0LXA and Phil – M1PAC on 20m and then on to 40m before it was time to pull the plug. 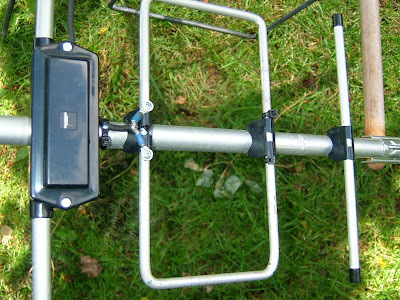 Next weeks contest is on 433 MHz, I am interested in finding out how well the new 10 Element Yagi will perform? I hope it is better than the 70 cms half of the IO loop that I have chopped off too mount the new Yagi, watch this space for either lots of cussing or a big smile. Radio, Radio and More Radio Please! Since last week I have been busy playing radio making some great contacts on many different bands. The week started off on 40m where I was in company with local Hams Adam - 2E0LXA and Phil - M1PAC. We were working as a group on the now QRM free part of 40m and managed contacts from G - land to Stateside. We had lots of QSOs with many stations calling in. I don’t think I’ve had quite so much fun on 40 in a long time. We will be active throughout the week once again as a group, if you do hear us please call in it will be a pleasure to get you in the log. We’re usually found around 7.130 +/- QRM from around 20.00 UTC. Other news was when I worked Steve DL1YAL “The Yorkshireman in Germany” via VO-52 for the first time. Steve has recently acquired a trusty old Yaesu FT790r and was coming through great during the pass. We have yet to work on FO-29, AO-27 and SO-50 as well as the ISS repeater. I have also had a lot of fun contacting a lot of my Ham friends and arranging skeds via Twitter, it sure is fun to Tweet, keep an eye on my Tweets to find out where I’m active. 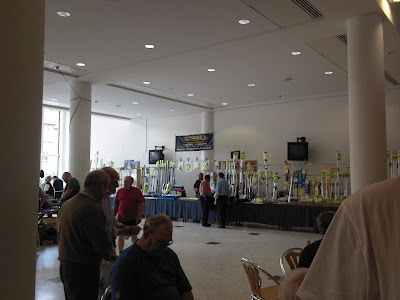 With the field day activities and various contests that have been taking place my radios have been busy up and down the bands all weekend. I was fortunate to catch the back end of some terrific ES taking place on 144 ssb, this happened on Saturday evening where I worked 2 brand new DXCC on 144MHz. The stations I worked were; CT1HZE - Joe, at a distance of 1191.9 miles (1918.2 km) and EA7TL - Juan, at a distance of 1210.6 miles (1948.2 km). Following on from such a good weekend on Sunday AM Louise (M3TLL) and I set off on our way to the York Rally. 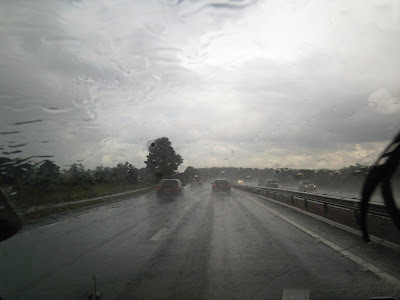 It was an exciting drive as we ended up driving through torrential rain but the old mobile shack got us there safely. 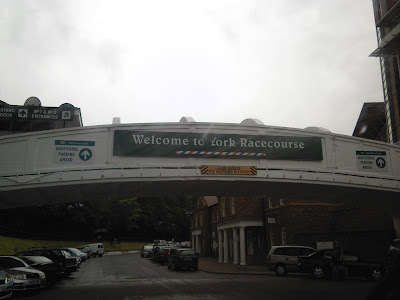 The rally was held at York racecourse, approximately an hour’s drive away. We weren’t there long before we bumped into fellow Craggies and other Ham friends and after a bit of chatting we were off to find some bargains. 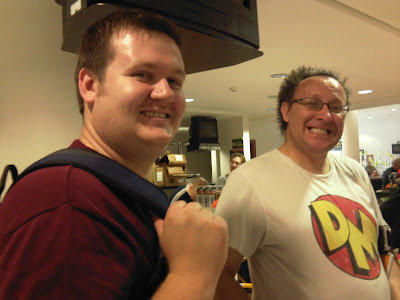 Adam - 2E0LXA & Phil - M1PAC, pleased with there bargains! 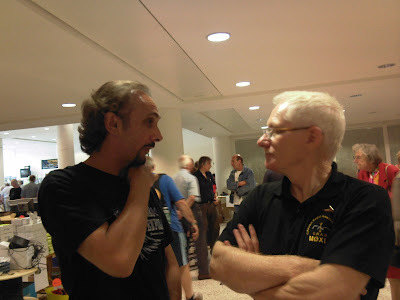 Myself & Kevin - M0XLT, In deep conversation. Whilst I was hunting for something for 435Mhz in the form of a Yagi Louise spotted my all-time favourite QRP Satellite radio the FT-470. Louise knew I already had one and rated it tremendously so she quickly alerted me so I could grab this bargain one at the rally. I won’t tell you how much I paid but it was a third of the price I paid five years ago for the one I already have. After comparing it to the modern transceivers I know I’ve got a bargain, I will be testing it out some more tomorrow. 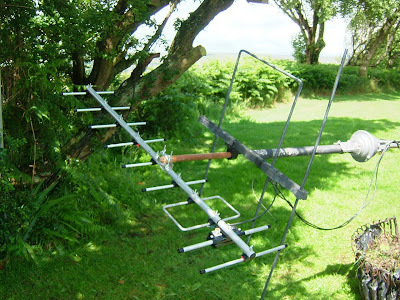 The other bargain I managed to gain was a nice 10 element 70cm yagi beam which I’ve already installed and it has been grafted to the IOio to make the ultimate satellite antenna hi hi. You can see a picture of it here. I’ve already tried it on VO-52 and FO-29 with some good signals coming through. I am looking forward to tomorrow night so I can catch AO-51 and SO-50 on the new IO/10-ele satellite buster. After a few nudges and hints to put a video together containing my Humble hombrew and commercial efforts that I call my Antenna set up, here it is!